Opening Night of the 2016 Chicago Critics Film Festival was packed last night with film enthusiasts and critics who filled the beautiful Music Box Theatre with a contagious cinema-loving buzz! It was a great kick to an annual festival I always look forward to, where viewers can choose from films that were seen by certain Chicago Film Critics Association board members at a variety of festivals and brought back to Chicago, sharing what they consider to be the best of their festival viewing experience. That doesn’t mean every film on the schedule is going to be great or even good – which is something I was reminded of on opening night, where I viewed what I consider to be one of the best films of the year and one I was tempted to walk out of. Both “Morris from America” and “Goat” premiered early this year at Sundance, one stars Craig Robinson and the other features a cameo from James Franco, both of whom are friends and have appeared in several movies together. Those are the common factors in these two different films. 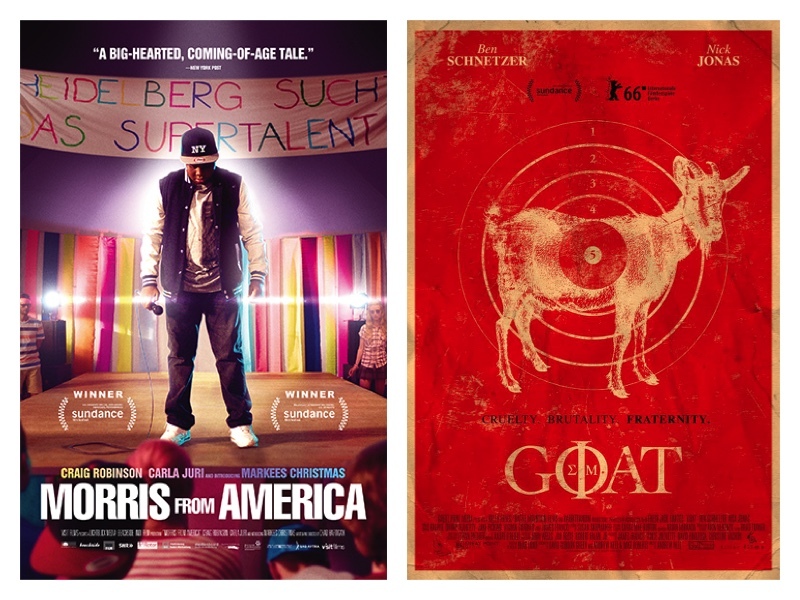 Here’s my mini-reviews of “Morris from America” and “Goat”…. 13-year-old Morris Gentry (Markees Christmas) lives with his widower father, Curtis (Craig Robinson), in Heidelberg, Germany, due to a soccer coaching job his father has there. Soft-spoken and somewhat shy around the mostly obnoxious German kids his age, yet in private Morris considers himself a pretty dope free-flowing rapper – that is, behind his closed bedroom door. Despite the fact that no one around them looks or talks like this African-American father and son, Morris is making the most of it by working on his German with a fun college-age tutor, Inca (Carla Juri) and taking a specific interest in flirty 15-year-old Katrin (Lina Keller), the cute and confident girl he fantasizes over. There’s a genuine and honest tone to the somewhat autobiographical story from writer/director Chris Hartigan (“This is Martin Bonner”), in its depiction of a creative young man trying to discover his identity and the patient father who does his best to facilitate an environment he and his son can bond. Hartigan has a real knack for offering authentic characterization for his actors – free of pretension or manipulation – providing a winning atmosphere to showcase the impressive dramatic chops of Robinson and the natural talent of newcomer Christmas. This is a sweet, funny and thoroughly enjoyable coming-of-age tale that will hopefully be embraced by a wide range of viewers. In the first fifteen minutes of director Andrew Neel’s brutal, violent and explicit drama, “Goat”, we witness Brad (Ben Schnetzer) getting severely beaten by two hooded strangers he offered a ride after a party. Still reeling from his ordeal, we catch up with him months later as he has decided to pledge to the same Phi Sigma fraternity his slightly older brother, Brett (Nick Jonas), belongs to. The hazing, led by pompous pricks (featuring overacting from Dixon Rowley and Gus Halper) who call the pledges ‘goats’, involves humiliation, physical abuse, berating and exclusion, as the pledges are ridiculed and belittled. The movie starts off proclaiming its “based on actual events” and although the screenplay co-written by Neel, David Gordon Green and Mike Roberts, indeed inspired by Brad Land’s troubling anti-hazing memoir, Neel’s need to cover endless cruel sequences of indoctrination during Hell Week forced upon these pledges gets real old real fast. There were at least four times that I wanted to walk out on this film – partly because I found these characters repetitive and boring and then there was all the nonstop cruelty on the screen. Sure, this is a look at peer pressure and masculinity, but more focus should’ve been on what motivates these pledges to continue with such abuse or a study on the aftermath of a traumatic event. When the possibility of an actual goat getting defiled by the pledges loomed, I found myself pleased when the goat wound up defiling the dorm room of the protagonist. James Franco, who serves as a producer, makes a cameo of a stunted alumni who drops in on his frat brothers to encourage and motivate them into further debauchery. “Morris from America” will be released from A24 later this summer in the States, on August 19th. Look for “Goat” to receive a theatrical release sometime in September.